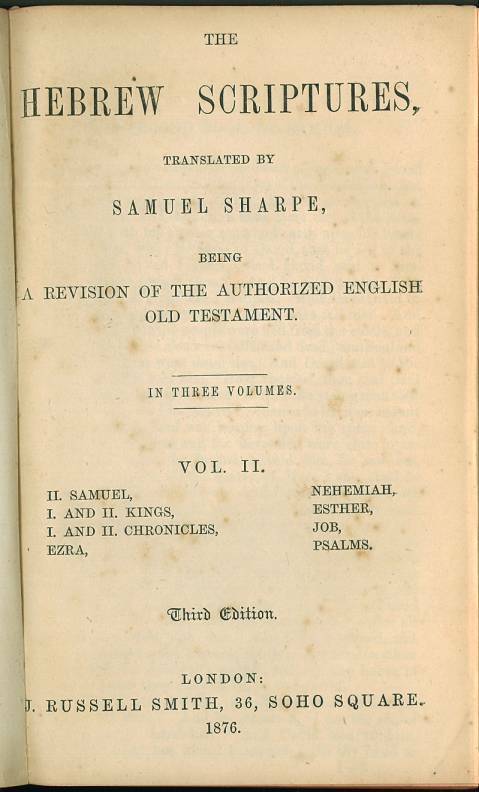 Click here for an article on Samuel Sharpe. 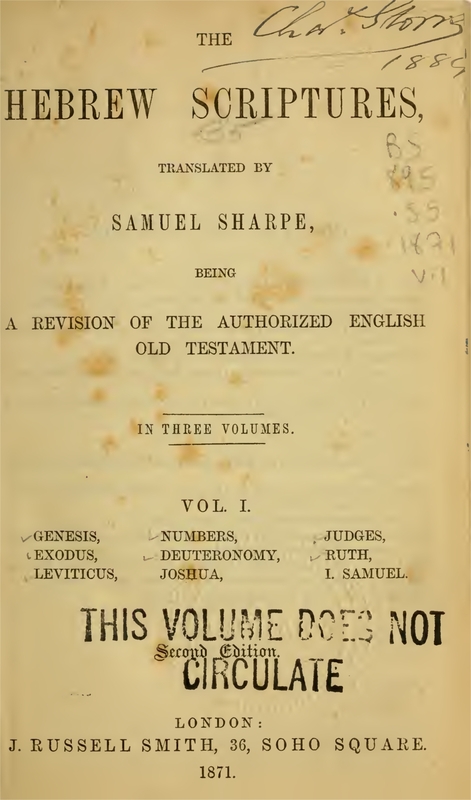 For sample verses from the translation by Samuel Sharpe, click here. References: Chamberlin 549-6; Herbert 1834, Taliaferro-EELBV 7495. Comments: The Second Edition was published in 1844 by Edward Moxon: London. A facsimile PDF of the Third Edition (1856) is available at books.google.com. 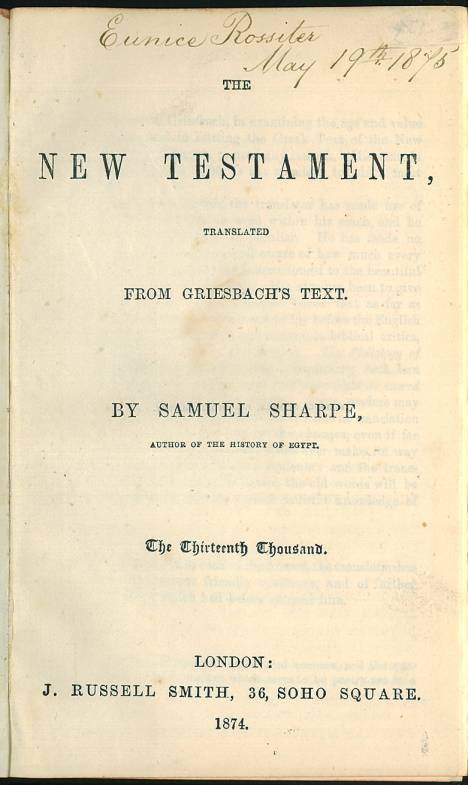 A facsimile PDF of the Fourth Edition (1859) is available at archive.org. A facsimile PDF of the Fifth Edition (1862) is available at books.google.com. A facsimile PDF of the "Fourteenth Thousand" (1881) is available at archive.org. 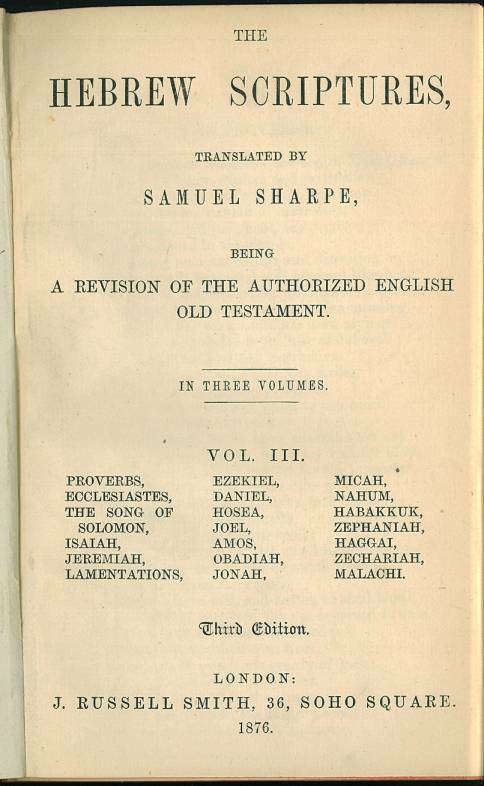 Title: The Book of Isaiah, Arranged Chronologically in a Revised Translation, and Accompanied with Historical Notes. 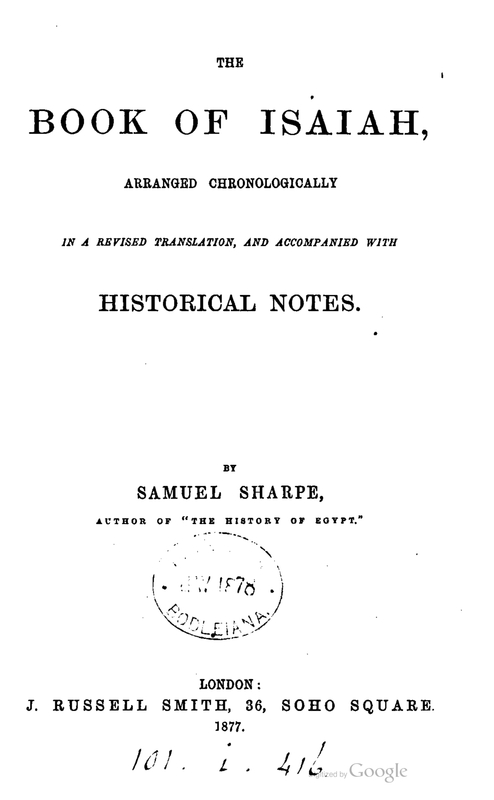 By Samuel Sharpe, Author of "The History of Egypt." Images: Title page (from online facsimile). 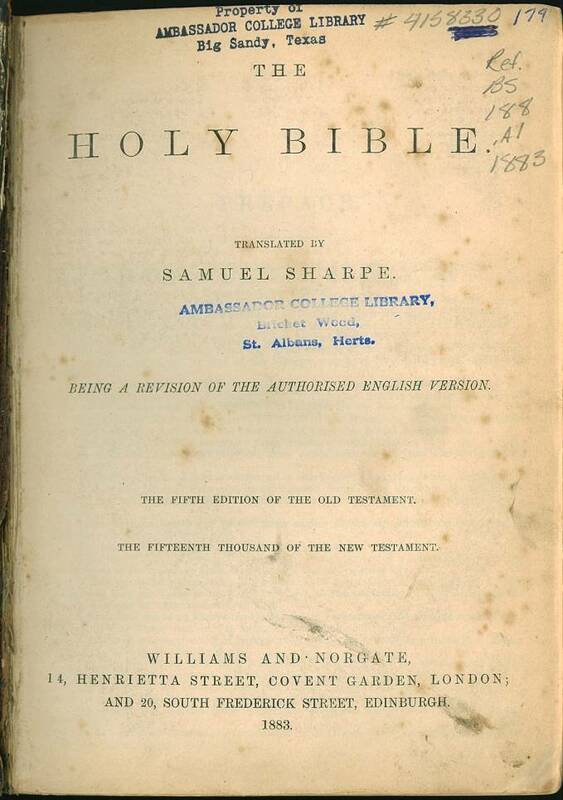 Title: The Holy Bible Translated by Samuel Sharpe. Being a Revision of the Authorised English Version. Contents: Bible (HC, 202 mm, p. iv, 768). References: Chamberlin 31-1; Herbert 1955, Taliaferro-EELBV 7495.120. 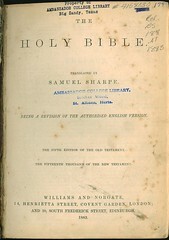 Comments: A facsimile PDF of the 1883 edition is available at www.archives.org. 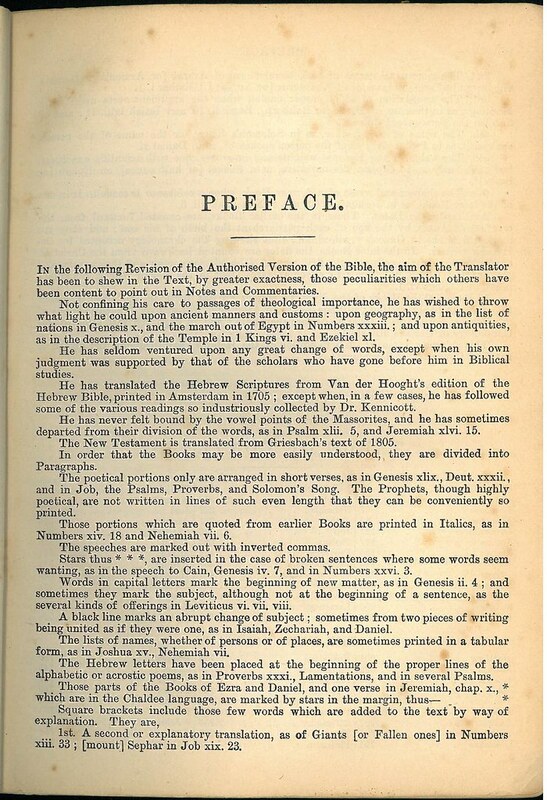 The first page of the Preface is missing from the online facsimile, but it may be found here.